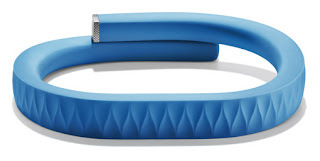 Jawbone, the maker of those iconic bluetooth headsets is at it again with the new Jawbone UP fitness wristband and the free UP by Jawbone App. This new fitness bracelet has a sleek futuristic look to it, and comes in a variety of dazzling colors to fit any taste. The UP features a built-in accelerometer which collects data about your activities, the food you eat, and even your sleep patterns (yes this is a 24-hour-a-day health monitor) which helps you set, and keep, fitness goals. 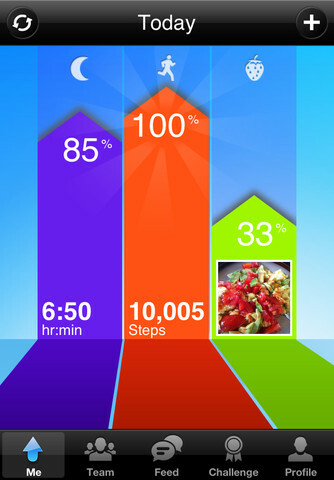 A unique feature of the Jawbone UP app is the ability to log your meals - simply take a quick photo of your dish, and respond to questions about how you feel after eating; this creates a journal which can help you to plan a healthier diet (for instance, if you logged meals containing way too many donuts, soda, and cookies; you would notice because there's now an "App for that") this may be one of the killer features of the Jawbone Up. Yes, you can work out with it The Jawbone Up is sweat-proof, and water-resistant meaning no fears in strapping it on for your next workout, or run. The precision motion sensor tracks all of your activity and even includes a vibration alert if you sit for too long to prompt you to get up and move. We have all been guilty of spending too much time in front of the computer; and now Jawbone will give you an excuse to increase physical activity, and burn a few more calories. With up to 10 days of battery life, and just 80 minutes to fully charge; the Jawbone Up is designed to be worn 24/7, the app also tracks your sleep time - light sleep vs deep sleep, and sleep quality. The Jawbone Up app also includes a smart wakeup alarm which allow you to program your wristband to vibrate, and wake you up at just the right moment - no more being late to work because you forgot to set the alarm!